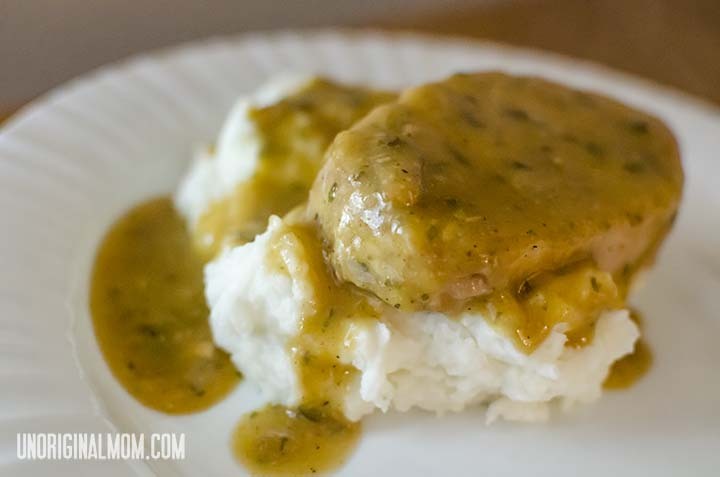 These Crock Pot Ranch Pork Chops are one of my favorites! I am normally not a big fan of pork chops. It is SO hard for me to cook them so they’re not overly dry or tough. But, I’ve found the answer to deliciously moist and tender pork chops – the crock pot! 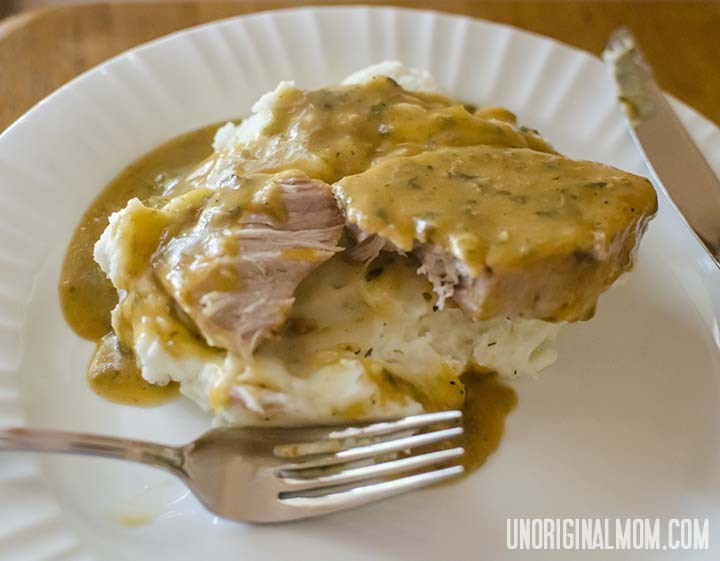 I originally found this recipe for Ranch House Crock Pot Pork Chops on Pinterest from Real Mom Kitchen. You can check out her post for the original recipe, which also includes a yummy looking recipe for Parmesan Mashed Potatoes. After reading all of the comments on her post (and knowing my family’s preferences) I adapted the recipe a bit to suit our tastes and came up with a version that’s a little less salty and has more gravy. They are so tender, they pull apart with a fork! Lots of flavor, and SO simple to make…it is a regular in our menu rotation. Cook on high 4-6 hours, or on low 6-8 hours. Oh yum! 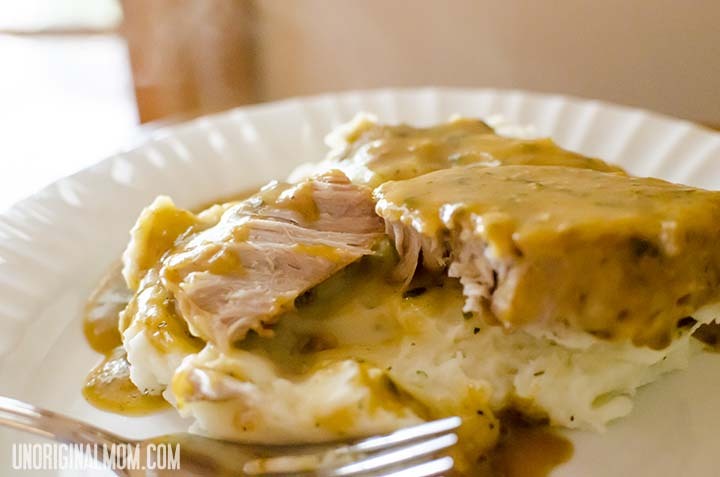 I love ranch and Hubby loves gravy so this will be a hit at our house for sure! I can’t wait to make it. Thanks! I am the same way, Maria, before I found this recipe I rarely made pork chops at all, I’m not a big fan of regular baked pork chops…but now I make these all the time! I love easy meals :) I’m your newest fan on Facebook! I’ve pinned this to try and I’d like to invite you to link up to my All My Bloggy Friends party – it starts on Tuesday mornings at 7 am Eastern time and goes until Saturday night! Feel free to share this post and/or any others you would like to share! :) I hope to see you there! Hi Jamie! I am a regular Bloggy-Friends-linker, love stopping by each week :-) I hope you try the pork chops, they are so yummy, and couldn’t be easier! Thanks for visiting & following! omg looks delicious will have to try it. I’m following from Show and Share Wednesday. You are very welcome, Debi! Hope you enjoy it! I have some bone-in chops in the freezer do you think it would work just the same?? And just to be sure, you just used the canned soup as is right? No added water? Hi Elicia, yes I think bone-in chops would work too! The meat will be falling off the bone by the time it’s done. And yes, just the canned soup as-is with no added water…it looks kind of goopy when you first put it all together, but by the end it’s a nice thick gravy. Just prepared everything but added a layer of onions and cubed potatoes.. all I have to do is turn the crock pot on tomorrow morning. Oo, that sounds delicious! You will have to let me know how it turns out with the potatoes…I always make mashed potatoes separately when I’m making this dish, but to skip that step would be great! I can’t wait to try this! I’ve recently been making my own cream of soups and this is the perfect recipe for them! Do you think I could add a can of green beans?? Thanks! aaarrgh! WHICH version/size pkg of ranch dressing? The 0.4oz buttermilk recipe? or the 1.0 Salad dressing & seasoning mix? I am making this for the first time because it sounds and looks so good. I don’t have any ranch dressing mix, so I added some parsley flakes, basil, garlic powder, pepper, paprika and a few drops of Worchestershire sauce to the cream of chicken soup. I also decided to make it a meal in one crockpot dinner, so I put small potatoes and onions under the pork chops, a few onion slices on top of the chops, then spooned the cream of chicken mixture over them. I will make sugar snap peas to go with it. I am already getting hungry writing this. It is so fun making up and trying new recipes, and using the crockpot is one of my favorite ways to cook. Ooo, that sounds divine! You’ll have to let me know how it goes with the potatoes and onions in with it. I usually make mashed potatoes to go on the side with the gravy, but skipping a step on a busy night would be great! Trying this, I added 1-8 ounce cream cheese. We will see….looks and smells awesome!!! I’m trying this and added 8 ounces of cream cheese. Looks and smells amazing. ! Easy bachelor food. Just finished cooking these and they turned out great. I seasoned and browned the porch hops before I threw them in the crockpot, and used 3 cans of cream soup (2 chicken and 1 mushroom) so I’d have a TON of gravy….. Who won’t be eating a pb & j sandwich during the graveyard shift tonight? THIS GUY RIGHT HERE. and one cream of mushroom! Still came out awesome! I bet that will make it even more delicious…hope you enjoyed it! It’s a family favorite around here! I’m trying the recipe right now…can’t wait!!! Help! Put them in frozen. Looked delicious a couple of hrs later (thick sauce) but now 4 hrs later the sauce is all liquidy. Not thick like before. Seems the juice from the meat over took the cream soup mixture. Hoping it will thinkin up. (?) Suggestions anyone? Btw smells DELICIOUS!!! Mine is in the crock pot as I type…and is smelling SOOOO GOOD!!! How big of a can of creamed soups do we need? 10Oz or family sized? The regular 10.5 oz size cans.